Note that the race start and finish is approximately 0.8 mi away at the trailhead to the Catamount Trail, off VT Rte 100. Participants can walk/run to and from the start/finish or ride the shuttle bus. All parking is at the Readsboro School and on Phelps Lane – there is no parking at the start/finish. REGISTRATION: Day of only, $15 ages 18-64yrs, over 65 & under 18 race for free. Please fill out a registration form and bring it with you to save time on race day. Proceeds go toward a donation to the E.J. Bullock Building Restoration Fund. RACE DAY CHECK-IN: 9 AM – 10 AM, Readsboro School. Leave enough time to get from the school to the start line. 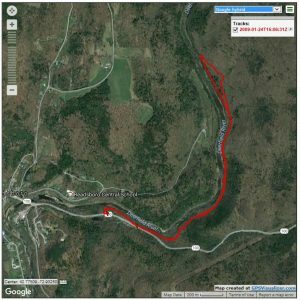 COURSE: A flat/rolling 5k out-and-back lollipop on the Catamount Ski Trail along the Deerfield River. If no snow a trail race may be held. DID YOU KNOW: the name of the race comes from the Hoosac Tunnel & Wilmington narrow gauge railroad, referred to by many as the Hoot Toot & Whistle. The railroad was established in the late 1800’s. Much of section of the Catamount trail that makes up most of the race course runs along the HT&W railbed.